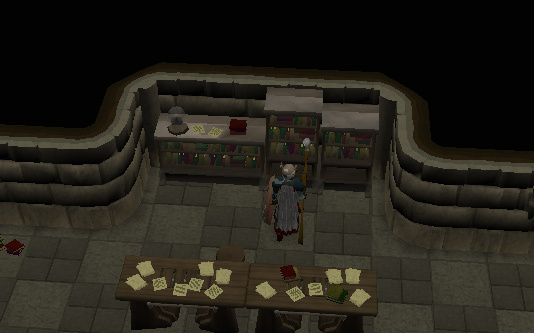 Talk to Apprentice Clerval in the basement of the Mage Training Arena. 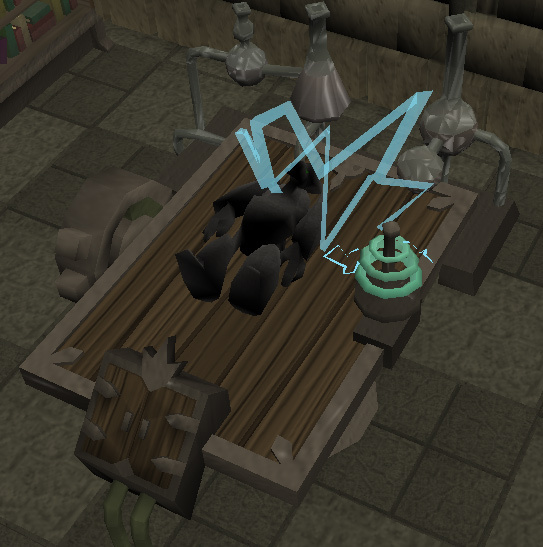 To start, travel to the Mage Training Area which is just north of the Duel Arena. Once you are there, go down the ladder on your left and talk to Apprentice Clerval. Tell him you'll talk to the Wizards about making a Rune Guardian for him and then head upstairs. The Wizards you need to talk to are Wizard Shug, Wizard Edvin, Wizard Dougal and you can talk to them in any order. Wizard Shug is upstairs and in the northern room. Keep hearing more of his story and he'll eventually say you need twenty pieces of Rune Essence and two enchanted Emeralds. 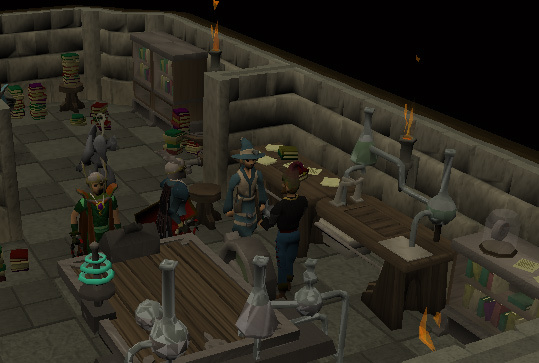 Head back downstairs and 'Operate' the Workbench that's next to Apprentice Clerval to get an enchanted Emerald. Do it again to enchant the other Emerald and then talk to Clerval who will take your Essence and Enchanted Emeralds. Wizard Dougal and Wizard Edvin are in the two rooms right next to Clerval so talk to them next. Dougal wants you to craft some combination runes and will supply you with a Water Talisman, a Fire Talisman, a Binding Necklace, 10 noted Pure Essence and tell you to search bookcases for the Combination Runes book which is found in a random bookcase. 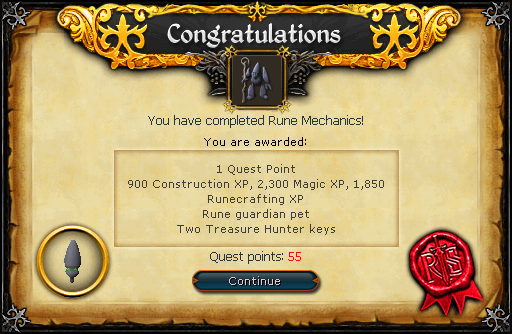 You do not need this to complete the quest or do anything at all with so if you don't feel like getting it, you don't have to. If you brought Steam Runes with you, speak to Dougal again. If not, read on if you need to know how to craft some yourself. To craft Steam Runes, you'll need 5 Water Runes, 5 Pure Essence, a Fire Talisman or Tiara, and a Water Talisman. You should also wear your Binding Necklace so there's no chance of failing to craft your runes. To make them, enter the Fire Altar just northwest of the Duel Arena's entrance and use your Water Runes on the Altar. Show Dougal your sweet new runes and then talk to Clerval to have him take your 5 Mind, Body, and Steam runes. As we all know, every decently easy quest wouldn't be complete with a fun maze/puzzle at the end! 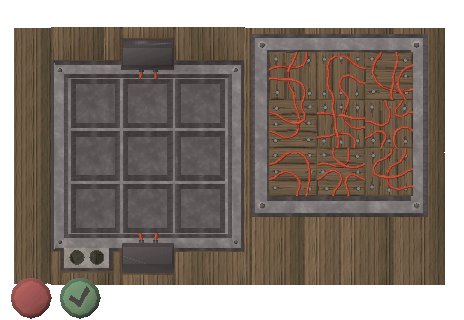 Talk to the last Wizard, Edvin, and after your conversation agree to go through his 36 square maze. The portal order is west, north, north, north. Once you complete the maze, Edvin will tell you to flip the switch to exit and give you Edvin's Tool. Bring the Tool back to Clerval and he'll tell you there are faulty wires in the Animation Table (another puzzle!). ....and the finished wiring should look like this. Talk to Clerval to learn one more thing he cannot do without your help: carve out a good Guardian body. He'll give you some Rune Essence so use Edvin's Tool with it to craft a Guardian Head, Guardian Body, Guardian Arms, and Guardian Legs. Talk to Clerval one last time to see a cut scene of the Guardian being brought to life. And with that.... Quest Complete! 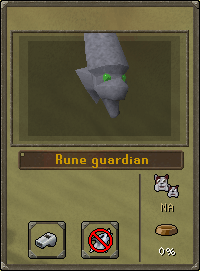 The Rune Guardian is another pet that will follow you around, talk to you, and require feeding. The only "requirement" is level 4 Summoning, but anyone who has completed Wolf Whistle will have at least that. Just like other pets, it will get hungry. To feed your Guardian, all you have to do is simply enter a Runecrafting altar. The Guardian pet is storable in the POH menagerie. [^] Talk to Apprentice Clerval. [^] Enchant 2 Emeralds on the workbench next to Clerval. [^] Bring 20 Rune Essence (regular or Pure) and the Emeralds to Clerval. [^] Talk to Dougal and bring him 5 Body Runes, 5 Mind Runes, and 5 Steam Runes. 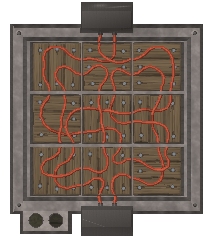 [^] Talk to Edvin and go through his maze (west, north, north, north). 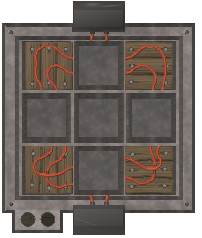 [^] Bring Edvin's Tool back to Clerval and fix the Animation Table's wiring. [^] Talk to Clerval, then use Edvin's Tool on the Rune Essence.